Get Discounts for Michie Tavern lunch - see below! 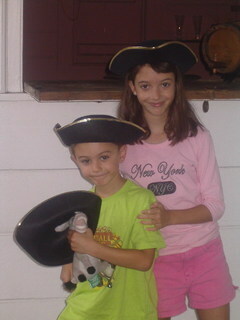 They even let you dress up in colonial garb at Michie Tavern. When you live in a tourist area and have relatives and friends come to visit, it’s sometimes a chore to have to visit the same sights over and over again. Not Michie Tavern. The tour is chock full of fascinating historical tidbits, each docent brings a slightly different perspective to the tour, and we always learn something new. So repeat visits would never be a chore for us, even if we had to pay admission (which we don’t, since we’re local residents…yep, local residents get the tour for free). Michie Tavern was established in 1784 by William Michie, a Scotsman, and provided weary travelers with food, drink, and lodging. An excellent example of Colonial Revival architecture, the tavern was actually built 17 miles from its present location (but was moved in 1927). In summer months or special occasions, you start the tour on the tavern porch with a refreshing cup of punch--made with strawberries, lemon, and mint—served by a costumed tavern “wench” (which was not a derogatory term, but just meant “waitress”). For the kids, they have a basket of colonial hats and costumes they can put on to get in the mood. The first time we visited they still offered guided tours, and the historical interpreter wore the full outfit, complete with mob cap, laced up bodice and wide skirt…and crocs! Back then, the interpreters would regale you with fascinating facts. Now, unfortunately, it is a self-guided tour, and you simply enter rooms, push a button on the walls, and hear a recording of facts about the rooms. It's not as fun or personal, but one positive is that the little ones may be less likely to get bored by long explanations. 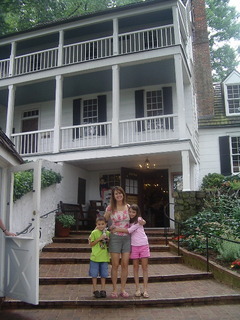 Getting ready for our tour of Michie Tavern with our friend Sissy. Guests in the 1700's bought everything a la carte: you paid for candles by the inch, rented a pipe or playing cards by the hour, and paid for an overnight stay based on the comfort level. At the end of the tour, you’ll step outside to see several outbuildings, including a smokehouse, a kitchen, and a well. You’ll then end up in the tavern gift shop, where you can buy really unique items, include embossed tea blocks , decorative plates, knick knacks, postcards, and toys. When we visited with my friend Vicky (back when they still offered guided tours where they taught you colonial dancing) she enjoyed the colonial dancing so much she bought a CD of colonial music so she could host a colonial dancing party. Note: due to the stairs, Tavern tours are not wheelchair accessible. After your tour, there’s still more to see. You can eat at the tavern's dining room, called "The Ordinary" (see below) or walk around the other shops, including "The Clothier" which sells authentic looking period costumes, and the "General Store," a restored mill, which has two levels of one-of-a-kind gifts, as well as a small exhibit with a recording telling the history of the mill and its waterwheel. Find out how the "toe-stir" got its name at Michie Tavern. Self-guided tours are offered continuously from 9:00 a.m. to 4:20 p.m. The good news is that they are $3 cheaper than when they were guided. Michie Tavern Tour admission: $5 per person adults, $4 for seniors and active military, and $2 for youth 6-11. If you eat lunch there, you'll save $3 on admission. Tours are free for local residents. For a delightful and delicious meal -- ahh, comfort food!-- don't miss The Ordinary, where the food is tasty, authentic and plentiful. The buffet (which includes seconds) includes fried chicken, pulled pork, black-eyed peas, cornbread, stewed tomatoes, green beans, mashed potatoes, and biscuits is served by costumed tavern wenches. The meal is $18.50 for adults, $10.95 ages 12-15, $6.95 ages 6-11. One child under 6 eats free with each paying adult. From time to time (usually during the off-season) they offer a local resident discount good for $4 of 4-6 adult lunch buffets, Mon-Fri. Expect to see this in the spring or fall. During the winter months, you'll see this discount extended to Virginia residents as well. Also, active military get $4 off lunch any day, as well as free tours of the tavern. For current deals, click here. Scroll down to the bottom of the page under "Site Features" and click on "Coupons." The Ordinary is open seven days a week for midday fare from 11:15 a.m. to 3:30 p.m., April through October, and 11:30 a.m. to 3:00 pm, November through March. It is closed Christmas Day and New Years Day.